NES Super Mario Bros. 3 (USA PRG1) "warpless" in 48:29.17 by JXQ. 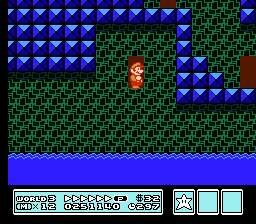 Super Mario Bros 3 completed fast ― without using the magic whistles. Although this movie doesn't use the magic whistles, it does skip stages, and actually skips them quite a lot, with the aid of various items such as the hammers. Note: This movie contains death(s). They are intentional, and save time. Read the author's comments for more details.